Carol's Theatre Reviews ~ It's Fun To Go Out: “Bull in a China Shop” “You want a revolution?" “I am a revolution." “Bull in a China Shop” “You want a revolution?" “I am a revolution." The old English15th century proverb ‘Children should be seen and not heard’ specifically referred to young women. No one told that to Mary Woolley who was on a journey to revolutionize women’s education at the dawn of the twentieth century. In 1899 New England she was interviewing for a job heading up a women’s seminary and she spared no one from hearing her out, vulgar language and all. “Listen. I’m a bull in a china shop. You give me a struggling women’s seminary, I’ll give you a fu**ing preeminent school of critical thought for women. You want training ground for good pious wives? F**k that. I’ll give you fully evolved human beings. So you’re afraid they won’t fine husbands? So what. I say: if a man is interested in a headless woman, send him to France. “Bull in a China Shop” by Bryner Turner is the opening show of Diversionary Theatre’s 33rd season, and what a doozy it is. Turner calls it a “Queerling” of history. 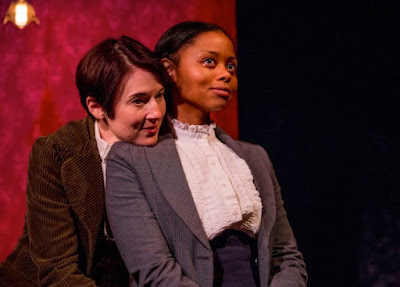 This is no “Children’s Hour”, Lillian Hellman’s play that premiered on Broadway about two women running an all-girls school, unjustly accused by an unhappy student, of being lesbians. Both women’s lives were eventually ruined. 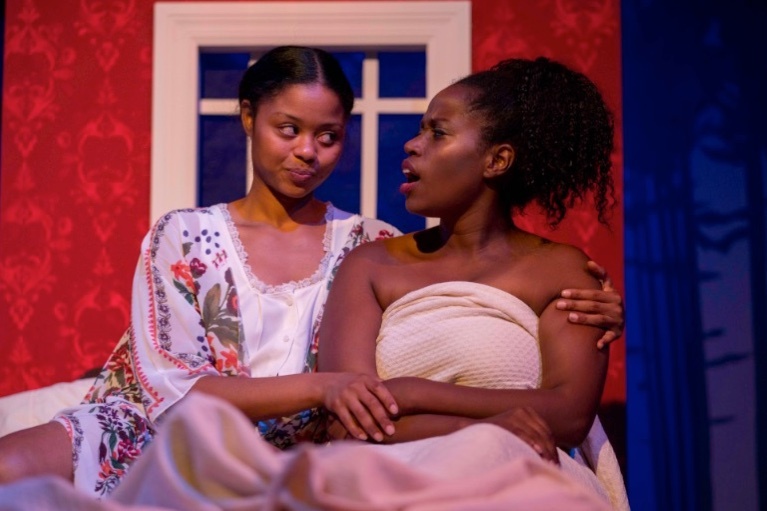 It is an in your face story of two women, Mary Woolley (JoAnne Glover- Moxie Theatre ) and her lesbian lover and former student Jeannette Marks (Tamara McMillian-“Men on Boats”), who schlep off to South Hadley Mass. to change the world. One is a student and would be teacher the other president of the college. 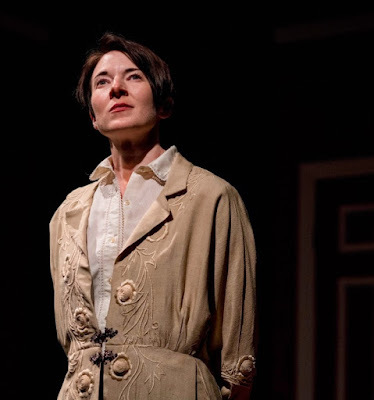 “Bull” traces Woolley and Marks’ tempestuous love affair through a modern lens but set at the turn of the 19th century that actually happened eons before the characters in Hellman’s 1934 play emerged. Leading up to her call to Holyoke Seminary for Women, (later changed to Mt. Holyoke) she was the first woman to attend Brown University in Rhode Island where she earned her Masters Degree and as we will learn both women, in their own right, had great influence on the Women’s Suffrage Movements that eventually led to the 19th Amendment and a woman’s right to vote. Director Kim Strassburger’s keen eye for its brevity (the show is 90 minutes in length) and pin point short scenes sets the stage on Ron Logan’s sparse one door, a few windows and bed that converts to a desk, frame the story as the life and vicissitudes of the women sea- saws back and fourth. While Woolley fought for the rights of the students to study lab, science and math and the donor’s were withdrawing their funds, Marks went on to create the first Theatre Arts Department and playwriting classes while getting her degree and becoming a sought after English professor. Inspired by their letters, ”Bull” tells it like it is. The women’s relationship lasted nearly forty years and made it through the good, the bad and the ugly including a little dalliance by Marks with one of the students (president of her secret fan club), Pearl (Andrea Agosto) who had a mad crush on her when Wooley was on an extended trip to Asia. Agosto gives a bravado performance when she is let down by Marks in their brief sexual encounter by standing outside her window and launches into a long diatribe of love, hate and revenge. Taking into consideration that so much is going on in a series of short sequences I never felt I was watching a play. The relationships are so genuine, so real I almost felt I was a fly on the wall seeing their love, joys and attitudes and ideas unfold, blemishes et al. Marks’s insecurities as a lover fearing the loss of love of Woolley’s affections hung over their heads almost until the president’s house became a reality and the two, not separated by dorm living, became a reality. Here they no longer needed to slink into each others rooms like it wasn't the best known secret on campus. With the ebb and flow of outside influences altering the back and forth and the strengths of their personalities shifting like the sands of time the women we met at the top of the show had reversed roles several times. Marks became popular with the students but scorned by the other faculty and Woolley matures in a way that felt as if she is almost backing down on her passionate desires to be a rebel and start a rebellion. Both Glover and McMillian are at their best when they are taking on the world outside themselves and come to the same conclusions but from entirely different mindsets. It’s also heartening and heartbreaking to be with them engaging in their struggles for equality, especially now. Little would they know that women are still fighting for those same rights. What would they have to say about the mindset of men that reduce women to objects in the 21st century? I would say that’s for another time, but the time is now! 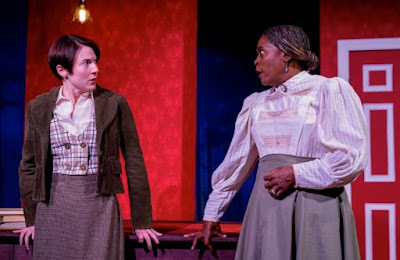 Costume designer Beth Connelly’ s aptly has Ms. Glover in more masculine attire while the multi racial cast is in turn of the century button up to the neck and floor length dresses or jumpers, all in Victorian getups, bloomers, buttoned up shoes and more femimine garb for Dean Welsh. 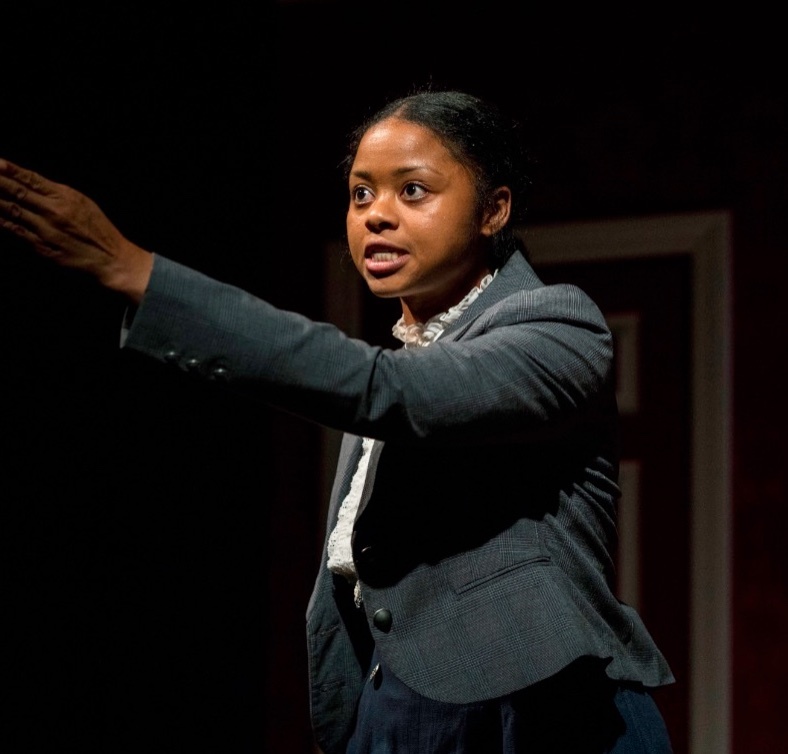 Curtis Miller’s lighting and TJ Fucella’s sound add to the overall feel and look at what Diversionary Theatre, Ms. Turner and Ms. Strassburger might happily call an overall successful opening season play.